The temple in Palani is one of the six renowned pilgrimage sites for Lord Murugan, in the form of Lord Dandāyudhapāni. While the story of how Lord Murugan came to reside in Palani is a popular tale, many have yet to learn of the ancient secret behind the making of the main idol and why the temple is a powerful religious healing centre. The idol in Palani, is in the form of an ascetic. Having renounced the world, Lord Dandāyudhapāni stands with a staff in his right hand and with rudraksha beads around his neck. Shunning all worldly possessions, the only apparel he has chosen to retain is a breechcloth. The temple has been sanctified by the penance of numerous sages and siddhas. In one of his immortal songs, the great Saint Arunagirināthar sang "My Lord, You sit on a Holy Hill which is superlative and exceeds even the spiritual glory of Kasi (Benares)." But it is Saint Bogar who played a pivotal role in the narratives associated with the Palani Murugan idol. Bogar, one of Hinduism’s eighteen greatest Siddhars, was a devotee of Murugan and founder of the Siddha alchemical practices. He's also said to have created and sanctified the Palani Murugan idol himself. Unlike other deities in Hindu temple, which are commonly sculpted out of granite, the idol in Palani is made of an amalgam known as navapāsanam. In Sanskrit, the word nava has two meanings. Nava means both 'new' and also 'nine'. Similarly, the word bhāsana also has two meanings. Bhāsana means 'poison' and may also mean 'mineral'. According to ancient literature, Bogar made the idol with a clever mixture of nine poisonous metals. He then harnessed the poisonous nature of all these metals, hardened it like granite and converted it into a beneficial amalgam with medicinal and curative values. The exact calculation by Bogar is still unknown, but substances that touch the idol are believed to acquire healing powers. Abhishegam, or ritualistic bath, to the Palani deity, normally using liquids such as milk, Panchamritham (a sweet jam-like mixture made from fresh and dried fruits, honey, jaggery, ghee, and other natural substances) among others, becomes a prasadam or offering with healing properties. Sandalwood paste applied on the idol and left overnight, is considered to act like a wonder drug for many incurable and complex diseases. It is miraculous that this delicately sculpted idol has withstood the effects time and countless abhishegams. 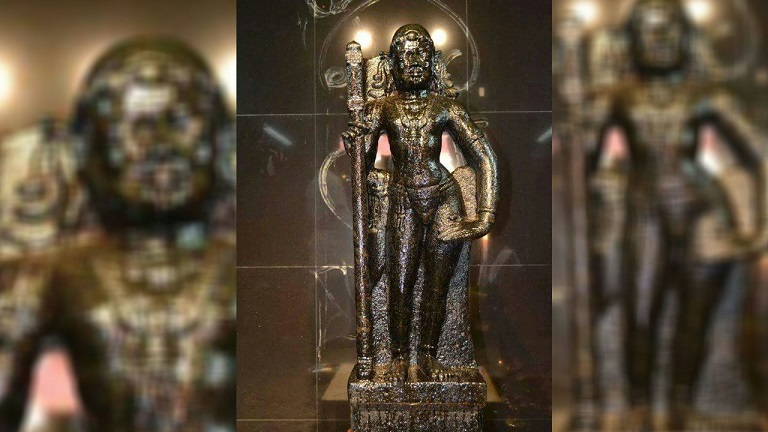 The idol continues to grace millions of devotees and stands as a testament to Bogar’s alchemical expertise. To this day, devotees on a pilgrimage to Palani can visit the shrine dedicated to Bogar in the southwestern corridor of the temple. Legend has it that it is connected to the subterranean tunnel cave in the heart of Palani Hills, where Bogar continues to meditate and maintain his vigil with eight idols of Lord Murugan.